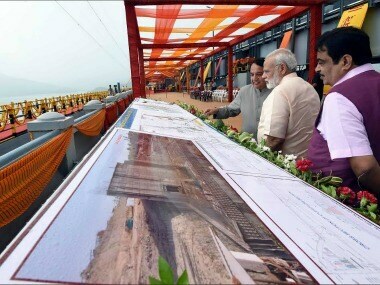 Prime Minister Narendra Modi inaugurated the Sardar Sarovar Dam on the Narmada river in Gujarat on Sunday. This is the second biggest dam in the world after the Grand Coulee Dam in the United States. On the occasion of Vishwakarma Jayanti, Modi dedicated the dam to the nation, saying the structure exhibits an "engineering miracle". 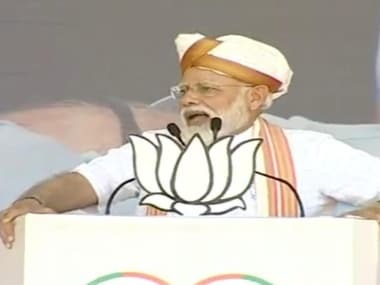 Speaking at a public rally in Dabhoi in Gujarat, Modi said this event marks another step towards building a 'new India' by 2022, when the country would mark 75 years of independence. He took this opportunity to remember Sardar Patel and BR Ambedkar saying the project would have seen the light of day decades earlier if they would have lived a little longer. "No other project in the world has faced such hurdles"
"However, the Sardar Sarovar Dam has seen many obstacles over the course of its construction," Modi said, adding, "No other project in the world has faced such hurdles. A massive misinformation campaign was launched against the project, and the discourse soon turned political." "I have knowledge ("kacha chittha") of everyone who tried to stall this project, but I will not name them as I do not want to go on that route," he said. Modi also outlined the financial hurdles the dam faced in its initial years. "The World Bank refused to give us a loan for the project citing environmental concerns, so we completed it on our own. Even temples donated money for its construction because people realised the significance of building the Sardar Sarovar Dam," he said. "I urge the pundits of engineering today to look at what we have achieved while facing these odds." Modi stressed on the deep water crisis in the western states of the country which he claimed to have witnessed first-hand when he served as the chief minister of Gujarat. He said, "When I used to visit the BSF jawans at the border I saw the hardships they faced when it came to water. I then resolved to build a 700-kilometer pipeline which would carry Narmada water to the soldiers defending our borders through the day." Modi said the lack of water resources which had been plaguing the pace of development in the western states will now be erased after the construction of this dam. He thanked Madhya Pradesh chief minister Shivraj Singh Chouhan and his Maharashtra counterpart Devendra Fadnavis for their help through the progress of this project. "But the ones I want to thank the most for the success of this initiative are the adivasis. They were always ready to make small sacrifices for the benefit of the nation. 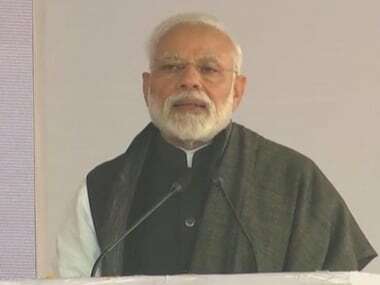 Today I take this opportunity to salute their contribution towards this effort," Modi said before announcing a museum which will house adivasi artifacts and exhibit the community's local history. 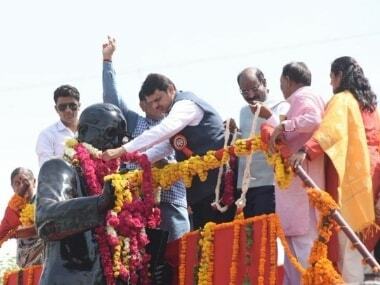 Modi also announced the construction of a statue of Sardar Patel, which "will be the biggest in the world". Saying India has a lot more to offer in tourism other than the Taj Mahal, Modi said, "Sardar Patel did not get due credit for his role in getting us independence from British rule, for various reasons. It is time we remember his contribution. This 190-metre tall statue will be twice the size of the Statue of Liberty in the United States, and people from around the world will come to visit this region and learn about him." Before his speech in Dabhoi, the Prime Minister had performed a puja at the site in Kevadia area of the Narmada district. Union minister Nitin Gadkari and Gujarat Chief Minister Vijay Rupani were present at the occasion. The inauguration of the dam, called the 'Lifeline of Gujarat', comes ahead of the state Assembly elections due later this year. "You know me, I can't do small things. I don't think small, don't do small things. With 1.25 billion people with me, I can't dream small," Modi said. Modi also said the BJP-led Centre worked towards the needs of the farmers in the country. "Our government at the Centre is one that is sensitive to the needs and concerns of the farmers," Modi said. Modi also said that it was time for a "madhu kranti" or a sweet revolution in Gujarat just like the White Revolution, while addressing a rally in Amreli. Batting for the sweet revolution, Modi said that it had the potential to change the lives of farmers in all of Saurashtra, a peninsular region in western India which covers 11 districts of Gujarat. Modi, who arrived Amreli on a one-day visit, also inaugurated a new market yard of Agriculture Produce Market Committee (APMC), Amar Dairy plant, and College of Diary Science. The prime minister also laid the foundation stone of a honey production centre in Amreli. At the rally, he emphasised that the Centre was putting all its efforts to make sure that the income of farmers increases by 2022. Nearly 56 years after its foundation was laid by former prime minister Jawaharlal Nehru on 5 April, 1961, the dam became a reality on Sunday after Modi unveiled a plaque and performed a puja at the site in Kevadia in Narmada district. The delay in the completion of the dam was due to several reasons, including a dispute between Gujarat and Madhya Pradesh on the sharing of the water and electricity. In 1964, the Centre appointed an expert committee under the chairmanship of Dr AN Khosla, to resolve the dispute. The apex court, on 18 October, 2000, in a 2-1 majority judgement, allowed construction of the dam up to the height of 138 metres subject to completion of the rehabilitation process. However, despite the court verdict, the construction of the dam continued to face hurdles on rehabilitation issue. In response to the NBA, the pro-dam people of Gujarat also launched many agitations citing its benefits. Modi sat on a 51-hour fast in 2006 as the Gujarat chief minister after the UPA government refused to allow raising the height of the dam.